How does hair loss differ in men and women? Hair loss and hair thinning are different in men and women. Therefore, the treatment for each also varies drastically. Read on to learn more about the difference between male and female hair loss. Male pattern baldness is the most common type of hair loss in men. It starts with a receding hairline forming a characteristic ‘M’ shape and thinning hair around the crown area. From there, the hair is lost from the crown, leaving a distinctive bald pate. Later it spreads until a distinctive ‘horseshoe’ of hair is left upon the sides and back of the head. Men suffering from this condition can start losing hair from a young age of 20, but more commonly it occurs amongst men between the age of 25 and 35. If left untreated, the hair follicles become more shrivelled and eventually, resulting in baldness. The Norwood classification is the most widely used classification for hair loss in men. 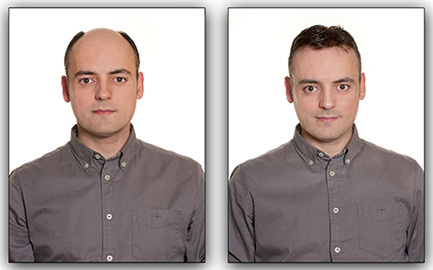 You can easily identify the stage of your hair loss by looking at the Norwood scale. Balding isn’t just a man thing; even women experience female pattern baldness. In this condition hair thinning starts with widening through the centre hair parting and spreads mainly on the top and crown of the scalp. Unlike male pattern baldness, the front hairline remains unaffected in women. The hair loss rarely advances to total or near total baldness, as it may in men. 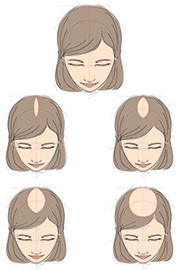 To identify female hair loss density the Ludwig Scale and the Savin Scale are commonly used. After pattern baldness, telogen effluvium is the most common type of hair loss in women. It is a temporary hair loss in which a lot of hair shed in a short period of time. In most cases hair loss in men can be blamed on heredity. Men who inherit hair follicles with a genetic sensitivity to Dihydrotestosterone (DHT) are most likely to experience male pattern baldness. Hair follicles sensitive to DHT begin to miniaturize, eventually dying. In some cases, male pattern hair loss can also be caused by certain cancers, medications, thyroid conditions, and anabolic steroids. The underlying causes of hair loss in women include conditions like anaemia, thyroid and polycystic ovary syndrome. A few studies have suggested that female baldness can also be genetic like male baldness. Studies have also found that a mother's family genes can be responsible for pattern hair loss in women, although further validation is needed to confirm the theory. Women can experience Telogen effluvium after pregnancy or due to starting or ending of birth control pills. Sometimes women also experience temporary hair thinning due to the excessive usage of styling and heating products. Many men choose to embrace baldness and hence prefer not taking any kind of treatment. Some go for methods like hair weaving, using hair fibres like KeraFiber and changing hairstyles that can conceal the baldness. Men who wish to restore their receding hairline often consider using medications like Minoxidil and Finasteride. Minoxidil is a topical solution that is applied directly to the scalp. There are many anti-hair loss solutions that contain 5% Minoxidil to stimulate the hair follicles and reduce hair loss. Finasteride is a drug that interferes with the production of DHT and helps stop hair loss. This drug is available in the form of pills that are marketed under the brand name Propecia. Baldness in women is still a social taboo and hence, most women seek treatment for even moderate hair loss. The only medication approved by the FDA to treat female pattern baldness is Minoxidil. For women, 2% concentration is recommended to slow or stop hair loss. 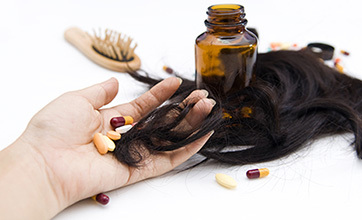 Women, who don’t wish to use Minoxidil, often consider using natural supplements to reduce hair loss . Others may prefer to go for a hair transplant, hair weaving, or change hairstyle to hide baldness or hair thinning.